In this multi-platform, multi-device, thousand-channel age we live in, it must seem almost unbelievable to imagine an era when a national broadcasting system consisted of just three radio channels and two TV stations. 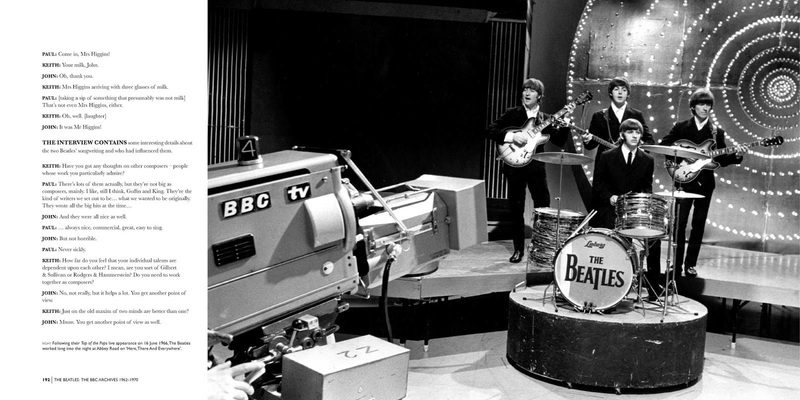 But that was the set-up in Britain in 1962, when The Beatles made their first appearance on BBC Radio. By 1946 the British Broadcasting Corporation (the "Beeb") had reconfigured its radio operations into three nationwide stations: the Home Service (set up in 1939 as the channel focused on news, information, talk programmes, drama, and educational programmes for schools); the Light Programme (established in 1945 as the home for popular music and light entertainment); and the Third Programme (set up in 1946 as the purveyor of classical music and "high-brow" culture). The BBC - a non-commercial public broadcaster - had been granted total control of the radio airwaves in Britain by a Royal Charter on January 1st., 1927. Its mandate - according to the first managing director, John Reith - was to "inform, educate and entertain". Up until the late fifties, popular music on the radio (the "wireless" as it was called back then) was dominated by crooners and dance-bands. Most of this middle-of-the-road pop music was heard on the Light Programme. Rock 'n' Roll music was almost completely absent from the airwaves. Part of the problem was "needle time" - an agreement between the BBC and both the Musicians' Union and Phonographic Performance Limited (a performance-rights organization and music-licensing company set up in the UK by EMI and Decca in 1934). The agreement struck between them stipulated that the BBC could only play up to five hours of commercial gramophone records during each broadcast day. This meant that a lot of popular songs and pieces that had been released on records were heard on the BBC not in their original form, but interpreted by one of several in-house orchestras and bands - like the BBC Radio Orchestra and the Northern Dance Orchestra, based in Manchester. Middle-of-the-roads-ville! The BBC Northern Dance Orchestra (based in Manchester) - rock 'n' roll it ain't! So it was hard to get access to rock 'n' roll music back then. You might get to listen to new records at friends' houses; or people would bring their collection to a party; or you could listen to discs in the "browseries" at record shops - like Brian Epstein's NEMS record shop in Liverpool; or listen to them on a coffee shop jukebox; or blasting from a tinny loudspeaker at a seaside fairground. It wasn't until the late fifties that the national broadcaster began to consider the kind of pop music that excited the kids. On weekdays in 1962 there was just one thirty-minute radio programme devoted to the rock 'n' roll sounds the teenagers were desperate to hear. These programmes - broadcast at 5 p.m. (soon after the kids were home from school) - were known collectively as Teenagers Turn. Each day's programme had a different title: the Thursday edition, for example, was known as Here We Go - recorded at the Playhouse Theatre in Manchester, under the production of Peter Pilbeam. It was on this programme that The Beatles made their radio debut on March 8th., 1962. The only ways for The Beatles to develop their popularity across the nation then - they still hadn't secured a recording contract - were through live stage performances and appearances on radio and television. The media work began slowly in 1962 - they did four radio shows that year - but by the time they had released their second hit single, in early 1963, they were in constant demand. And by the end of that year that had made almost 50 appearances on BBC radio. Once they hit their peak of this early fame - which the press soon dubbed Beatlemania - they were given their own radio series. 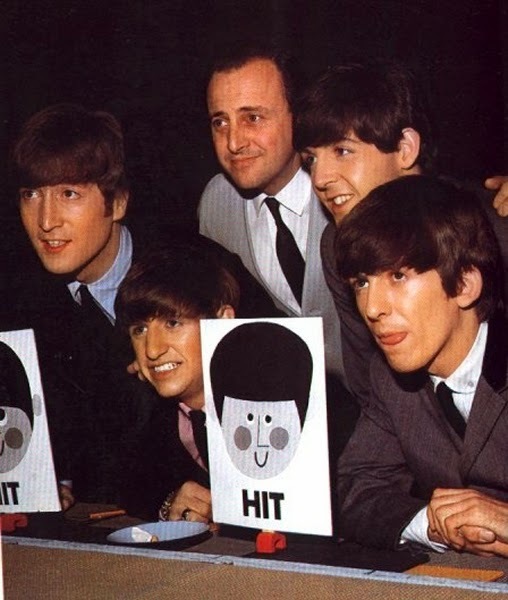 Through the summer of 1963 they hosted Pop Go The Beatles, a fifteen-week run of thirty-minute programmes for which they would have to provide six songs per show. Of the 56 different songs they performed on Pop Go The Beatles, 26 of them were never released during their career. And so it went throughout their time on "the wireless". Between March 1962 and June 1965 they played 88 different songs on 53 radio programmes - a total of 275 musical performances. 36 of those songs were never released on record. But they are of tremendous interest, because many of them were staples of their live performances - cover versions which reveal some of the main influences on their style and repertoire. Chuck Berry was their favourite. They did nine of his songs. And - except for "Roll Over Beethoven", which featured George - John took lead vocals on all of them. They did six covers of Carl Perkins on Pop Go The Beatles. Perkins was one of George's favourites. They did four each of Elvis and Little Richard - interesting, because they recorded all of those Little Richard songs, but never covered Elvis on disc. They loved his early phase, but seemed to have become disenchanted with the post-army Elvis. The legacy that The Beatles left to the BBC only really began to get its due in 1982. To honour the twentieth anniversary of the band's first radio broadcast (March 8, 1962), BBC producers Jeff Griffin and Kevin Howlett put together a special programme called The Beatles at the Beeb. 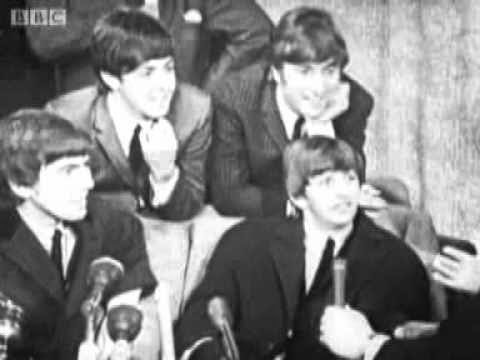 They managed to dig up from various different sources tapes and records (from BBC Transcription recordings released to radio stations around the World) that included songs and voice-only interludes featuring the Fab Four in playful conversation with various well-known BBC "comperes" (hosts) of the period. The response to this one-off special was so favourable that Howlett returned to the source material in 1988 - by then a lot more material was unearthed - and produced a series of 14 half-hour shows called The Beeb's Lost Beatles Tapes. And then in November 1994 a double-CD collection titled "The Beatles - Live at the BBC" was released. It contained 56 of the BBC sessions from the 60s, and sold five million copies in just six weeks. After the success of the first radio special - The Beatles at the Beeb - Kevin Howlett prepared a modest book to accompany the programme. 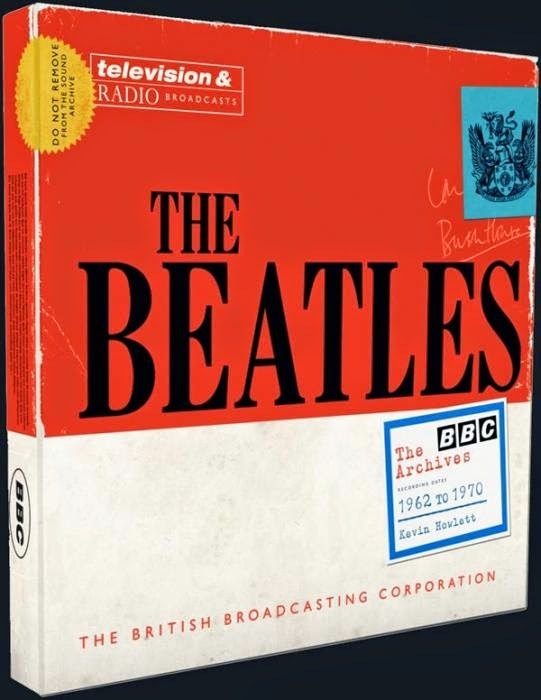 Published by the BBC in 1982, the book - also called The Beatles at the Beeb - tells "the story of their radio career 1962-65". The first section of the book describes their radio work at the BBC during those four frenetic years. The second section provides information and commentaries about the 88 songs they performed on radio - the most important part of the book for serious fans. And the final part charts the dates and details of the individual programmes. I picked up a copy of The Beatles at the Beeb when it was first released. It's a small, 128-page paperback, but packed with precious and little-known - at that time - details about a very important element of the band's career. 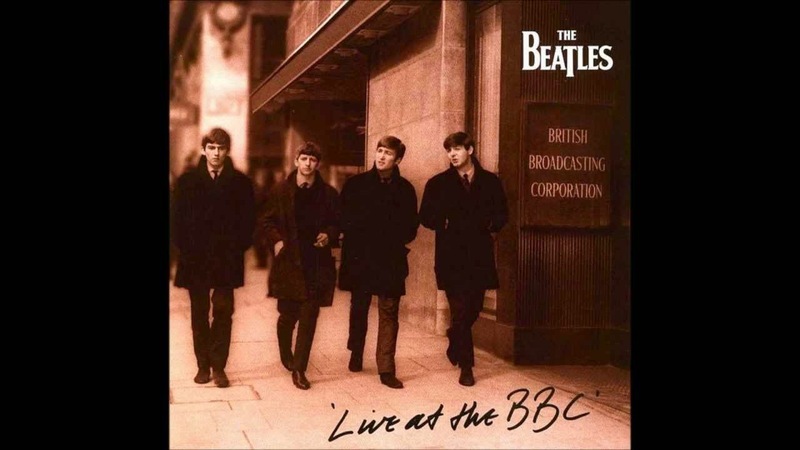 From 1982 we flash forward to November, 2013 - a second double-CD of Beatles radio recordings was released, called On Air - Live at the BBC, Volume Two. But more importantly, the CD release was coordinated with the publication of a new book by Kevin Howlett. This one is titled The Beatles: The BBC Archives 1962-1970, a lavishly-illustrated, 336-page hardcover published by Harper Design. In addition to fleshing out the material covered in his first book, in this volume Howlett documents their performances on BBC-TV and the non-performing appearances - mostly interviews - on both radio and TV in the late 60s. It's a comprehensive and detailed account - clearly the definitive treatment of the subject. Any fan of The Beatles who grew up through the 1960s listening to BBC Radio, and recognizes the names of programmes like Saturday Club, 625 Special, Top of the Pops, and recalls the names of hosts like Brian Matthew, Alan Freeman, Rodney Burke, Lee Peters, and David Jacobs will get a lot of pleasure out of this book. Newcomers to this aspect of the Fab Four's career might also find this day-by-day, week-by-week story of their work on BBC Radio and TV of interest. The main body of the text consists of nine chapters - one for each year running between 1962 and 1970. Each chapter begins with an introductory essay that summarizes the main social and political events of the year; that's followed by a full account of how The Beatles and the Beeb interacted that year; and the chapter concludes with precise details about each radio or TV programme they appeared on (date of recording, date and time of broadcast and rebroadcast, and channel of transmission). It's a complete inventory. How did it all begin? The Beatles travelled to Manchester for their first audition with BBC Radio on February 12, 1962. They performed McCartney's "Like Dreamers Do", Lennon's "Hello Little Girl", and covers of "Memphis, Tennessee" and "'Til There Was You". Producer Peter Pilbeam wrote this astute comment about the band on the official BBC audition form: "an unusual group, not as "Rocky" as most, more C&W, with a tendency to play music." About the relative merits of the prime vocalists, he wrote: "John Lennon - Yes; Paul McCartney - No." Having passed that formal appraisal from Mr. Pilbeam, The Beatles returned to Manchester on March 7th., 1962 and were recorded live in front of a studio audience at the Playhouse Theatre. They wore their new suits for the first time. John did "Memphis, Tennessee" again, and The Marvelettes' "Please Mr. Postman"; Paul did Roy Orbison's "Dream Baby". The performance went well and was broadcast the next day. Pilbeam booked them for two more shows in 1962 - broadcast on June 15th. and October 26th. By the time of that last appearance in Manchester, they had a new single to promote ("Love Me Do") and a new drummer, replacing Pete Best. 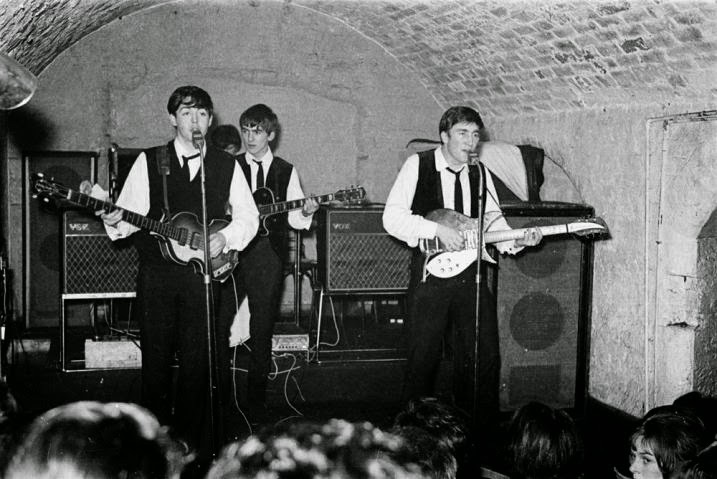 The Beatles' first performance in front of TV cameras happened at The Cavern in Liverpool on August 22nd., 1962. But it wasn't filmed by the Beeb. Granada Television, the regional station in north-west England that was affiliated with ITV (Independent Television - a commercial alternative to the BBC), recorded the lunchtime show on Mathew Street. The footage showed the band doing one of their standout songs - "Some Other Guy", with John and Paul doing a dual lead-vocal throughout. The performance was good, but the quality of the picture was not. Granada decided not to broadcast it at the time, but they unearthed the footage much later, after the band had made it very big - airing it first on November 6th., 1963. The Beatles did their first audition with BBC-TV on November 23rd., 1962. 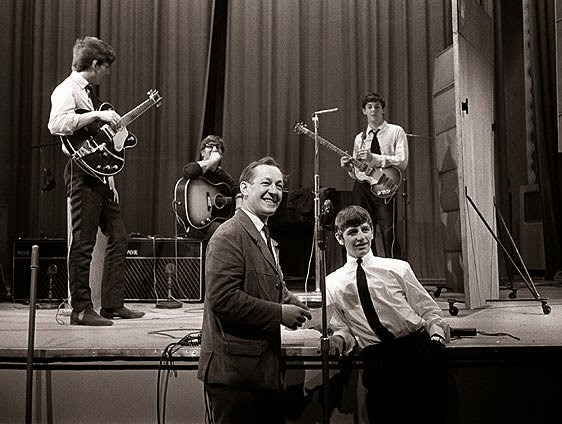 They passed the audition with no problem, but they were so busy now, and the options for performances on BBC-TV were less numerous and more competitive than for the radio, that the band had already done 11 shows for ITV before they put in their first BBC appearance on the 625 Special on April 16, 1963. This discrepancy between the two TV systems continued throughout 1963: only 9 of their 36 TV appearances that year were on the Beeb's television channel. 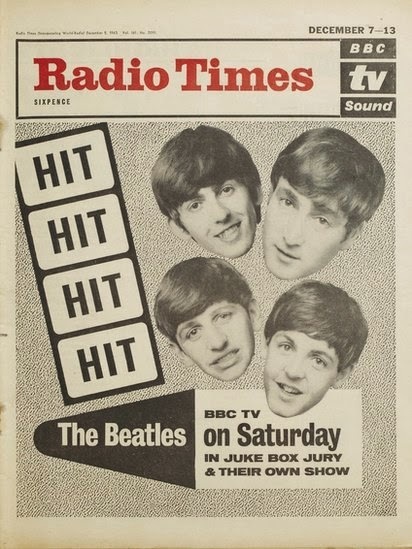 The Beatles started to make regular appearances in BBC's Radio Times - the Beeb's weekly programming guide - on the cover and inside. The cover of one edition in December, 1963, promoted their appearance on the TV programme Juke Box Jury. It was their most significant TV gig for BBC-TV that year. Juke Box Jury was a very popular staple of Saturday-evening viewing. By 1963 it averaged about 10 million viewers per episode. Each week a new panel of four celebrities - usually from the world of entertainment - would hear excerpts from brand new 45 rpm records ("singles"). Each would then be asked to make a brief comment and vote on whether they thought the disc would be a "Hit" or a "Miss". Lennon had actually been on the programme before - without his bandmates - on June 29th. The jury was usually an eclectic mix of personalities; so it was a groundbreaking event to have all four members of the same pop group serving at the same time. Juke Box Jury was normally recorded in London at the BBC-TV Theatre in Shepherd's Bush Green, hosted by David Jacobs. For the special Beatles edition on December 7th., 1963, the programme was filmed at the Empire Theatre in Liverpool in front of an invited audience - members of The Beatles' Northern Area Fan Club. The show was a huge success - drawing an incredible viewership of 23 million - including me (11 yrs old)! Incredibly, in the early to mid-60s, the bulk of TV programmes filmed by the BBC, and most of the audio recordings done for the "wireless" were not saved. The film and tape were reused. 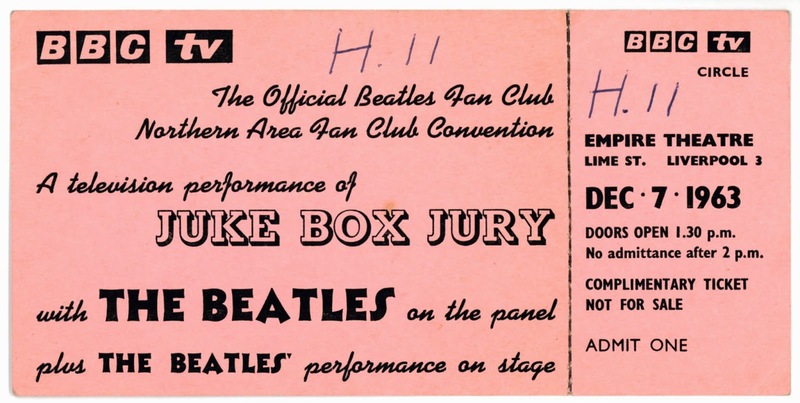 The Beatles appearance on Juke Box Jury is gone - just a memory for people like me, who tuned in between 6:05 and 6:35 that early December evening. 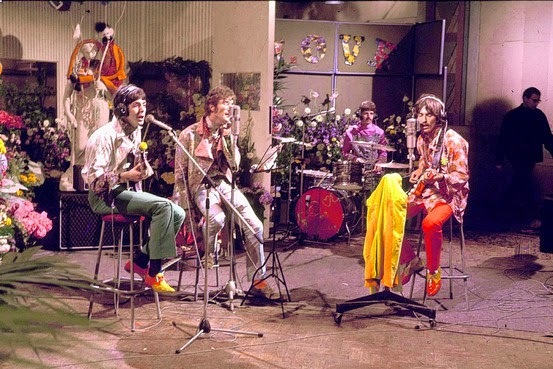 Another memorable Beatles' event on BBC-TV was their appearance on the special "One World" telecast. It was the first TV programme to link five continents live via satellite. The two-hour programme was to contain short features from 14 contributing countries around the globe. 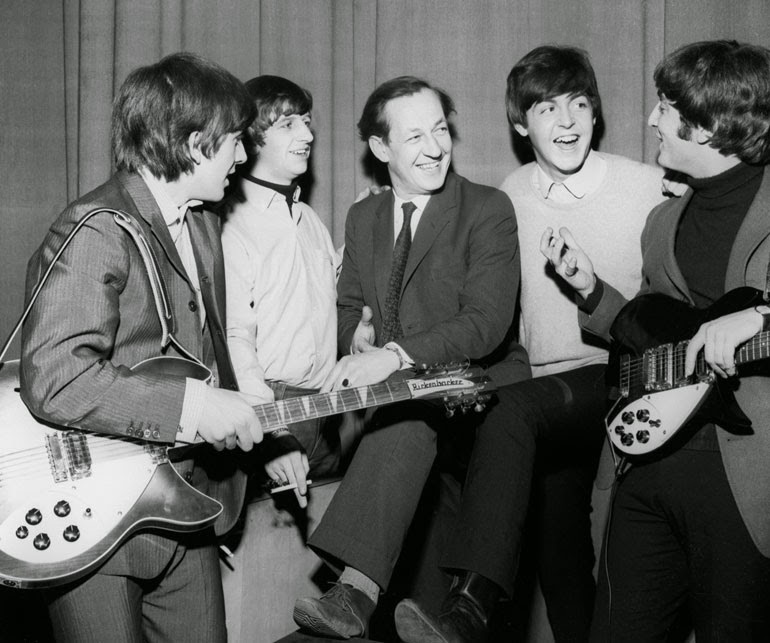 The BBC wrote to Brian Epstein in February, 1967 explaining an idea that they had come up with for the British feature: "We would like to offer from Britain the subject of The Beatles at work ... in a recording studio making a disc." The band agreed. 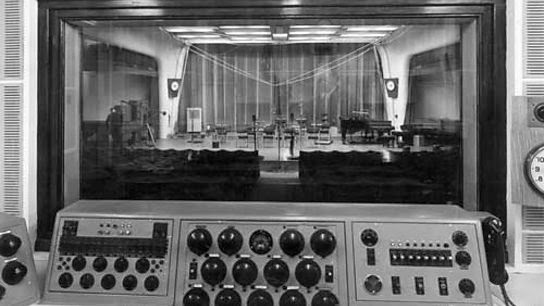 An remote broadcast was organised from EMI's Abbey Road - Studio One. Lennon wrote (or finished, perhaps) a song just for the occasion - "All You Need Is Love". 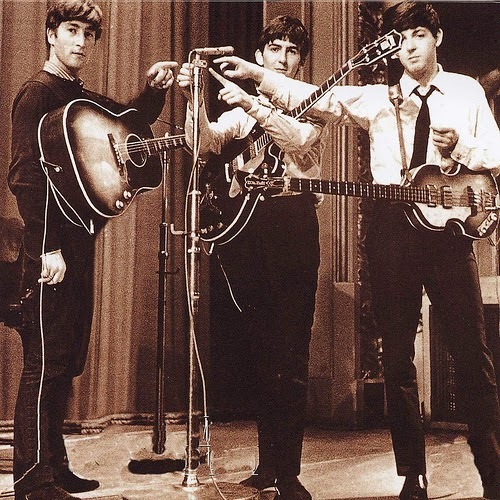 The band prepared a basic rhythm track; for the broadcast Lennon sang the lead vocal live (nonchalantly chewing gum at the same time) to the pre-recorded track, and the group was accompanied by a symphony orchestra. The historic broadcast took place on June 25th., 1967 - at the height of the "summer of love". An estimated global audience of 500 million people watched this first significant use of satellite broadcasting. By 1964 BBC Radio was being hard-pressed by the "pirate stations" - commercial radio enterprises that were set up on boats in the North Sea and English Channel, just beyond the territorial limits and the control of the British government. Radio Caroline was the first, but lots more floating stations followed. BBC executives realized that they had to respond to the demographic shift. They could not continue to limit "pop groups" (rock 'n' roll bands) to a few brief radio programmes, and the occasional spin of a hit record on Childrens' Favourites (with Uncle Mac), Housewives' Choice, and Two-Way Family Favourites. Bernie Andrews, one of the Beeb's more forward-thinking radio producers of pop music programming, had been pushing for a late-night pop show. He was finally recruited to establish such a show. It was called Top Gear and it would be hosted by the affable and ubiquitous Brian Matthew. The programme featured straight rock music, not a bland middle-of-the-road mixture of "light entertainment". The Beatles appeared on the very first edition of Top Gear on July 16th., 1964. They engaged in some typical repartee with the host. One of the topics of discussion was the band's songwriting. And it came up that Ringo was now attempting to pen a song - at which point Paul breaks into the opening lyric of "Don't Pass Me By", a country-flavoured ditty not recorded by the band until four years later for the "White Album". Another interesting titbit from Top Gear (this from November, 1964) reveals a never-to-be broken policy of the band to keep singles and albums as separate entities. Brian Matthew muses about the group releasing tracks from an album as singles. John quickly corrects him: "You can't release singles off an LP after the LP has been out." Brian responds: "A lot of people do." But not The Beatles. It did become de rigueur in the 70s, however, to exploit a hugely successful album by releasing three or four of the tracks later as singles. Amongst the many radio and TV interviews transcribed for this book, there are four that Matthew did for the BBC Transcription Service. This division of the Corporation was set up in the mid-1930s in order to distribute British culture to the Empire and, later, the Commonwealth. BBC offices were set up in countries all around the World. Radio stations in those countries could buy the rights to broadcast BBC Radio programmes (music, comedy, current affairs, drama, etc.) twice within a limited period. These programmes were shipped to the interested stations on discs - shellac 78s in the early days, and then vinyl LPs. In the mid-60s Brian Matthew began interviewing rock stars for the Transcription Service. They were given the old-fashioned name of Pop Profiles. He talked to John and George in November, 1965, and then did the same with Paul and Ringo in May, 1966. These interviews have recently been released in their entirety on the double-CD BBC release On Air - Live at the BBC, Volume Two. One interesting, and amusing, feature that runs through this book are samples provided of detailed Audience Research Reports. After most significant programmes - on both the Radio and TV services - a department at the Beeb would do comprehensive research about the audience's reaction. This research was not restricted to the demographic that one might expect that programme to be aimed at. Media back then were not "narrow-casting"; they were doing true broadcasting. All sorts of age-groups and many different social types would be listening to what the BBC was offering. Here's a choice example. The Beatles made their 53rd. and final musical broadcast for BBC Radio on May 26th., 1965. It was heard later on June 7th., Whit Monday - a Bank Holiday - on a show called The Beatles Invite You to Take a Ticket to Ride. Did everyone by now just love the Fab Four? About 25% of the audience were characterized as negatively disposed to the entertainment on offer. They described pop music, in general, as "ghastly", "insane", and "jungle music". The Beatles tracks, in particular, were dismissed as "monotonous bangings". As one listener expostulated: "Oh, the deadly monotony of this kind of music!" The interviews - both individual and group - featured in this book show a steady change in tone and content. In the early days the band were playful, cheeky, and irreverent. The between-song banter with the radio hosts was full of laughs and send-ups. This was new, at the time, and very refreshing. 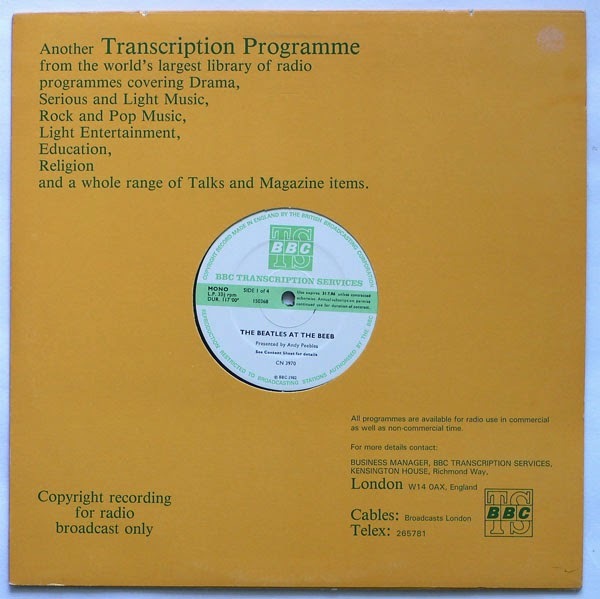 Most of the interview snippets heard on the two double-CD sets of BBC radio performances are of this type (except the Pop Profiles material I mentioned earlier). 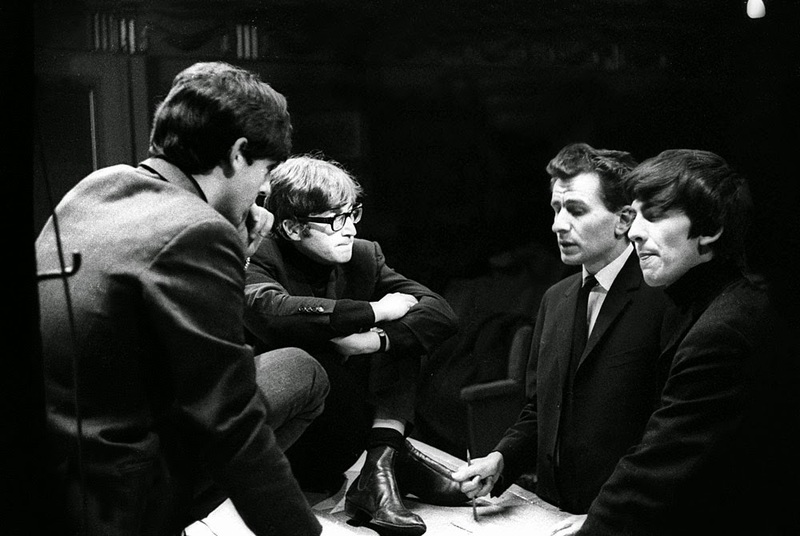 But as time went on, especially after the band stopped touring and stopped performing live on radio and TV, the interviews (more often done as solo conversations with individual Beatles) became more thoughtful, decidedly serious - and sometimes, even, a bit weary. Two interesting examples of this tendency stand out for me in this book. 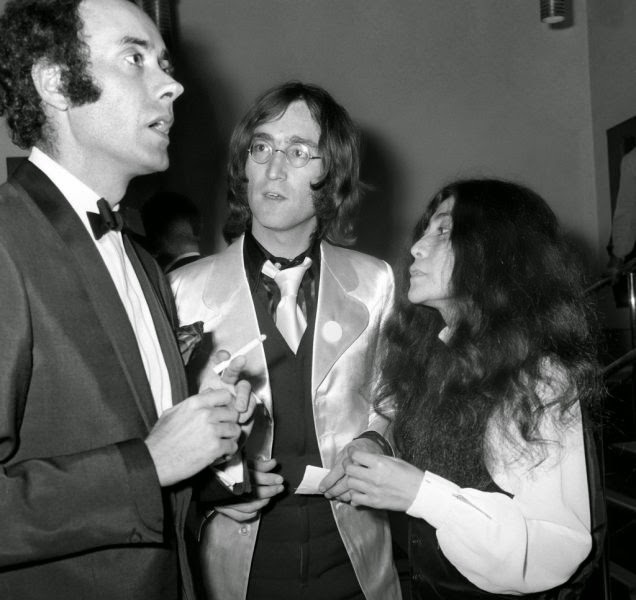 There is a fascinating dual interview done by Peter Lewis with John Lennon and Victor Spinetti for the BBC2 TV programme Release. Spinetti has the distinction of appearing as an actor in all three Beatles' films - A Hard Day's Night, Help! and Magical Mystery Tour. Amazing, really! He was also involved with a 1968 National Theatre production called The Lennon Play: In His Own Write, a dramatized version of material from Lennon's two books of surreal and absurdist writings called In His Own Write and A Spaniard in the Works. The interview revolves around John's fascination with how well the dramatization catches the mood and meaning of his acerbic work. With his typical lack of restraint, Lennon declares at one point: "I think our society is run by insane people for insane objectives." And then there are excerpts from a BBC Radio 1 programme called Scene and Heard, hosted by David Wigg. Ten of its editions in 1969 featured Wigg in conversations with each of the individual Beatles. The talk is relaxed and each of the soon-to-be-ex-Beatles is candid about their current opinions, and the state of their relationships with each other. The best of this material was released on vinyl in 1976 by Polydor Records as The Beatles Tapes - a double album sporting an all-black cover with sparse white lettering. It could be called "The Black Album"! Of course, I bought it back then, as soon as it came out - adding it to my quickly-expanding Beatles collection of recordings, movies and books. They were even on Grandstand! Here are a few other things covered in the book that I found of interest. When The Beatles made their historic first visit to the U.S. - primarily to appear on the Ed Sullivan Show - Brian Matthew phoned them soon after their arrival in New York City on February 8th., 1964.. The interview - done via the trans-Atlantic telephone cable - was aired on Saturday Club. The band returned to the U.K. on February 22nd. It happened to be early on a Saturday morning. For BBC-TV, Saturday afternoons were devoted to sports programming; from 1:00 - 5:15 they would broadcast Grandstand, hosted by the versatile David Coleman. On that particular Saturday, Coleman had been dispatched to Heathrow airport at 7:00 a.m., in order to greet the band and interview them exclusively for BBC-TV. So there they were, at the beginning of that week's Grandstand broadcast talking to a sports journalist about their triumphant visit to The States. In the midst of this exuberant interview, Coleman asked the lads if they supported Liverpool Football Club (what about Everton, David?). Paul - on behalf of "plastic fans" everywhere - declared: "We support whoever's winning all the time." Speaking of sports, The Beatles concert at Shea Stadium, in Queens, New York City, on August 15th., 1965, was eventually broadcast on BBC-TV 1 on March 1st., 1966. The production team cheated with the sound - bringing in the band to CTS Studios in London, in order to do some post-production overdubs. First and last appearance on Top of the Pops - miming to "Paperback Writer" and "Rain"
BBC-TV's flagship pop-music programme was the weekly Top of the Pops. It had been running every Thursday evening since January 1st., 1964. 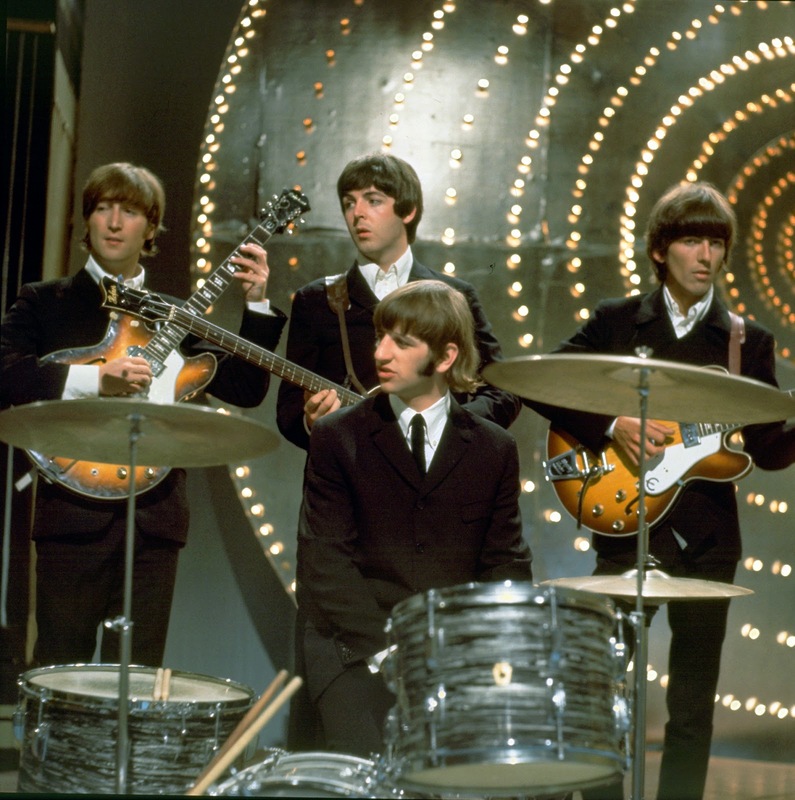 The Beatles had never appeared live on the show - for their most-recent singles they had supplied the programme with filmed performances. But finally they did do the show - miming to both sides on their new "Paperback Writer / Rain" single. Coincidentally, it was not only their first live appearance, it was also their last; in fact, it turned out to be their last "performance" on a TV pop programme. The Beatles ran afoul of the BBC censors twice during their career. The first time was when the track "A Day in the Life" (from Sgt. Pepper) was banned from airplay because of the refrain "I'd love to turn you on." There was an interesting exchange of letters between the "brass" at the Beeb and Sir Joseph Lockwood, the Chairman of EMI Records - the company that owned Parlophone, The Beatles recording label. [The only other track banned outright during the 60s was "We Love the Pirates" by The Roaring 60s. It was a single released in 1966 as a protest against government plans to outlaw pirate radio stations broadcasting into Britain from outside its territorial waters. It was the popularity of the pirate stations, by the way, which led to the establishment in September, 1967 of BBC Radio 1 - a channel devoted, unlike the Light Programme, almost entirely to pop music] The ban against "A Day in the Life" continued into the early 70s. 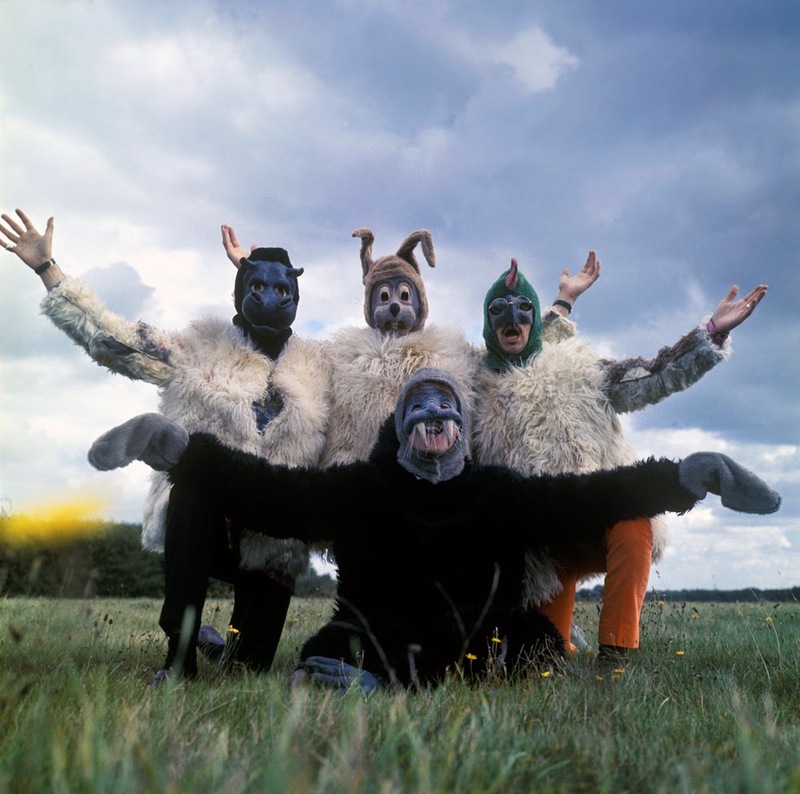 The other Beatles track banned by the BBC Controller was "I Am the Walrus". He thought that the line "Boy, you been a naughty girl, you let your knickers down" was unacceptable. The song was recorded for The Beatles self-produced film Magical Mystery Tour in late-1967. Interestingly enough, it was that same BBC Controller who negotiated with Paul McCartney (in the absence of the late-Brian Epstein) the rights to broadcast the film on BBC-TV 1 on Boxing Day, 1967. Despite some good music featured in it, the rather experimental and surrealistic film did not meet the "light entertainment" expectation for early-evening Boxing Day viewing. The programme got a critical drubbing - probably the worst reception ever given to a major project undertaken by the band. The fact that the psychedelically-charged film was shown on BBC 1 in black-and-white probably didn't help. It was rebroadcast on BBC 2 in colour ten days later - not that that did much to improve the majority opinion. The Beeb's Audience Research Report said that 75% of people had a negative reaction. A typical quote from the report: "It was a complete jumble, with no shape or meaning." 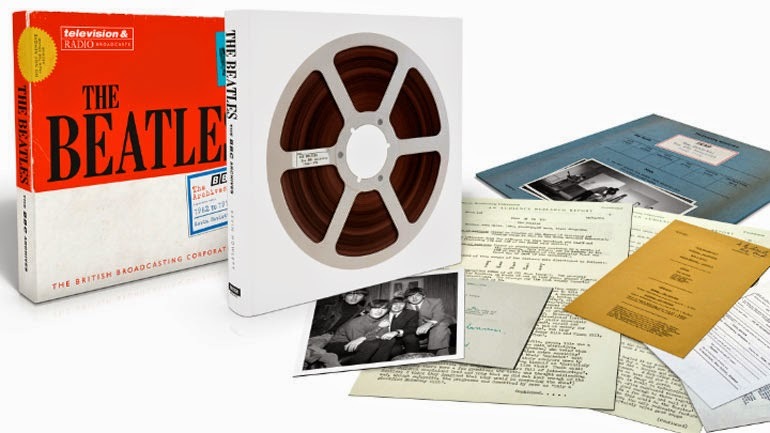 In addition to the main text, The Beatles: The BBC Archives (1962-1970) is appended with a 10-page detailed section of broadcast information and commentaries on all the songs performed by The Beatles on BBC Radio or TV. 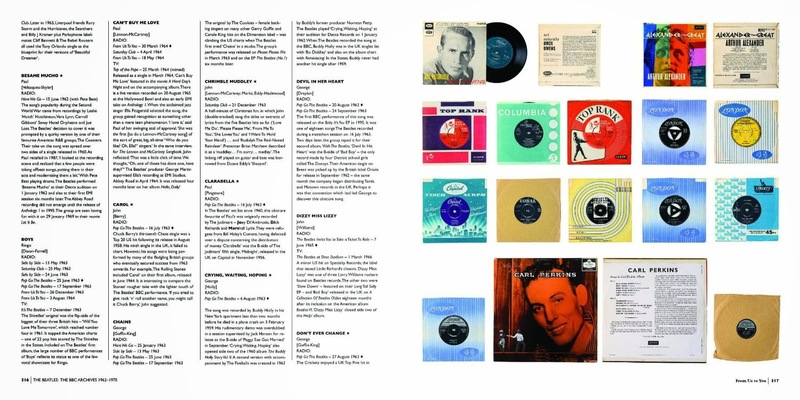 This section includes five pages of pictures of LP and single covers by the artists who did the original recordings. 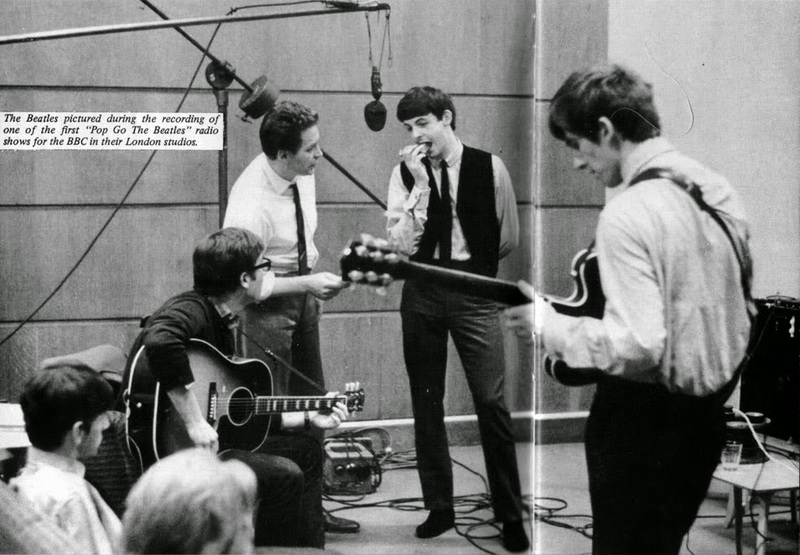 There is also a brief, but important, essay at the back of the book which outlines how the producers and engineers recorded The Beatles for radio broadcast - and how their methods differed from the way things were done at EMI's Abbey Road studios. When The Beatles were recording for the BBC, for example, they didn't have a lot of time. EMI gave them three hours to do two songs. At the BBC it was six songs in as little as ninety minutes. 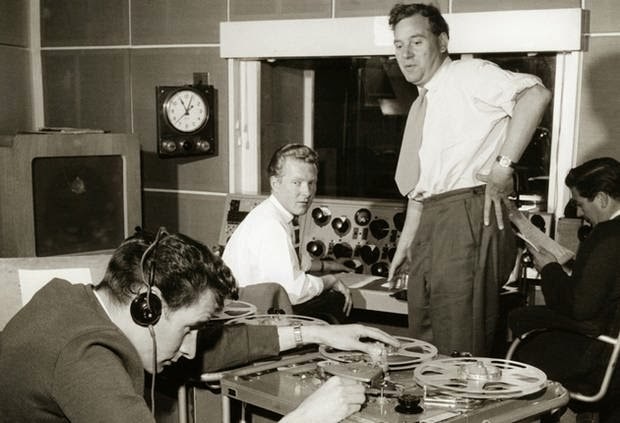 There was no multi-tracking at the BBC, which used mono tape recorders. They could do occasional overdubs - or "cut in" an instrumental solo that was impossible to do live (George Martin's keyboard solo in "A Hard Day's Night", for example). And they often spliced together the best sections of different takes - so a song might be made up of three different takes of a song. This sort of editing was a specialty of Bernie Andrews. Most recordings, though, were done live - direct to tape. And, occasionally, the band was forced to perform live to air - which never seemed to bother them. A lot of experimenting was done with microphone placement. The drums were recorded with ribbon mics. Sometimes the ribbons would break when the sounds got excessively loud. They put a 4033 mic - dubbed the "gin bottle" - right inside the bass drum. To get vocals from Ringo they had to suspend a cylindrical, silver-coloured C12 microphone (12" long, 2" in diameter) from elastic strings - they didn't have the modern steel booms to hold mics suspended over large distances. For vocals and guitars they generally used condenser mics, in order to get a fresh, bright sound. Guitar amps had microphones dangled in front of the speaker cabinets - attached from the amps' handles! They experimented with reverb, and were able to exploit the natural echo generated inside the cavernous Paris Theatre in Lower Regent Street. Whatever it took to improve the sound, and obtain some interesting effects - Bernie Andrews was willing to give it a try. The Beatles: The BBC Archives (1962-1970) is a unique and definitive work. Much of the material found here has been released before in other formats - but this project collects all of this related stuff together in a well-organized and beautifully-illustrated book. It fills a particular niche - probably of more real interest to Beatles' fans who grew up during the 60s in the grip of the Beeb and all her multifarious works. It would be a fascinating eye-opener, though, for those new to the scene, who would like to explore what it's like to live in a more closed and conservative society - in which the media are limited, very tightly controlled, and, therefore, of enormous influence. The Beatles not only took advantage of this narrow and concentrated scene to advance their career; they also helped to loosen its rigid and autocratic grip. I love all this Clive. Well done. Are there any books that focus on the sociological side of the Beatles,,their impact on society and the world? has anybody tried to work out the sociological implications of what happened to them as working class, lower middle class lads in Liverpool ? A book like that would really interest me. I want to know all the other stuff too but I can rely on you to tell me that!!! ha! ha! I can't think of a book that you describe; however, Ian MacDonald's excellent book, "Revolution in the Head" - which is a track-by-track account of every Beatles' song released on their official recordings (singles, LPs and EPs) during their career - does get into some of the sociological and political context surrounding some of the major songs (e.g., "Revolution", "I Am the Walrus", "Tomorrow Never Knows", "Revolution 9", "A Day in the Life", "Strawberry Fields Forever"). It's one of the best books I've read focused on the music. Thanks for this thorough and well illustrated review, Clive. I really enjoyed reading it. The Beatles early radio programmes were news to me; I was at Ches during this period and of course had no access to a wireless. Cheers. 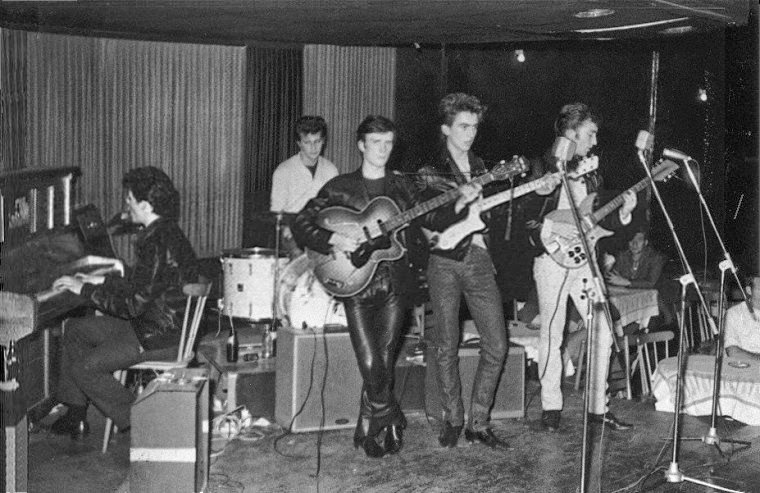 That photo is absolutely NOT a radio audition in Manchester, that is in Hamburg, shortly before Stuart Sutcliffe left the band. Stuart never auditioned for the BBC with the Beatles or any other band, and the Beatles never auditioned for the BBC before 1962. Thanks for the correction. The photo was misidentified at the source. I was also confusing it with another photo of a Beatles audition - the one they did for Larry Parnes in Liverpool on May 10, 1960. Stuart was at that one. And the band had a stand-in drummer for the occasion - Tommy Moore. I have changed the photo caption. Apart from that, how did you like the review?